So you've been to town a few times and feel that you know the City of New Orleans pretty well. You've seen the Antebellum mansions Uptown on our Queen of the South tour and you've ridden down beautiful Esplanade Avenue to city park and ate beignets beneath the Oaks, what's next you ask? Well how about a ride through two neighborhoods that most visitors rarely venture to? If you're someone who likes to experience things that most people never will, then this tour is for you. If you're ready for a new New Orleans experience, do yourself a favor and book this tour. This 8-mile tour will take you through New Orleans' first suburb better known to the locals as a Faubourg. We'll ride through the Marigny & Bywater neighborhoods who lay claim to being the home of the largest collection of 19th Century homes in America. 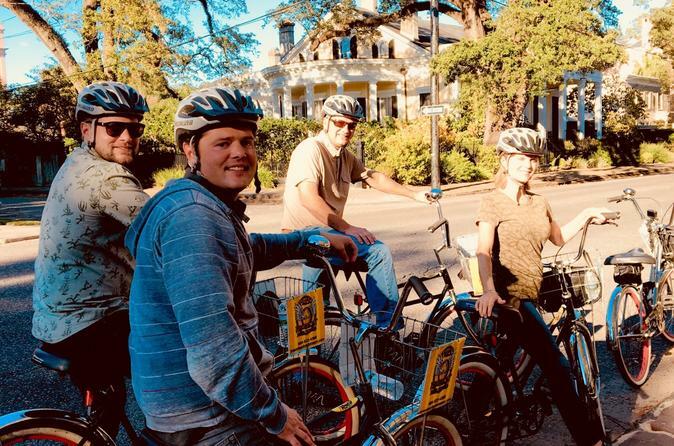 The quiet and tranquil backstreets of New Orleans are the perfect setting for you to enjoy a most mellow and relaxing bike tour during your vacation to the Big Easy; you'll also learn how the city got that name. Oh, and did we mention that you can smell the aroma of freshly roasted coffee floating on the air to the tune of song birds singing in the trees? If you've never had that experience, you should, it could change you forever. The Marigny & Bywater tour was created to give our riders the opportunity to get way off the beaten path. We hope to see you soon on the backstreets.